Storing and handling expressed milk properly is vital to maintaining the nutritional integrity of the milk. Following these guidelines will ensure your baby receives the best benefits from the breast milk. If possible, it is best to cool expressed milk immediately after expressing. 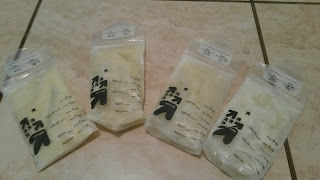 Ideally milk should be stored in clean bottles or freezer bags made specifically for breast milk. Make sure to leave space in the container for the milk to expand when frozen and write the date on the container. Store milk in 2-4 ounce increments to prevent waste. Avoid adding fresh milk to previously refrigerated or frozen milk. Instead, cool milk before combining. If milk has gone bad, you should be able to tell by smelling it. Sometimes milk may smell or taste soapy, this milk is not bad. It is just the breakdown of milk fats and most babies will still drink it. To thaw frozen milk, put it in the refrigerator approximately 12 hours before use or hold under running water, gradually increasing the temperature of the water. Once milk is thawed, it can only be kept in the refrigerator for up to 24 hours. Do NOT refreeze thawed milk. To warm the milk, heat water in a small container and place milk in water to warm up or use a bottle warmer. NEVER microwave breast milk or heat it directly on the stove. Always test the temperature before feeding. The fats in the milk will rise to the top of the bottle. Do not shake it, but instead gently swirl it to mix. Shaking breaks down the proteins in the milk.